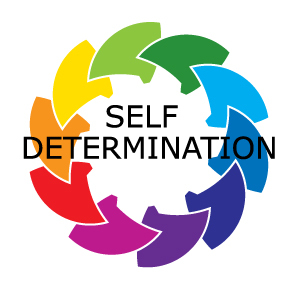 Self Determination – Making Connections. Finding Solutions. Self determination is believing you can control your own destiny. Self-determination is a combination of knowledge, skills, and attitudes that lead people to set goals for themselves, and to take the initiative to reach these goals. It is about being in charge, but is not necessarily the same thing as self-sufficiency or independence. It means making your own choices, learning to effectively solve problems, and taking control and responsibility for one’s life. Practicing self-determination also means one experiences the consequences of making choices. Promoting self-determination should begin before high school. Students in elementary and middle school (no matter their level of disability) also need to be taught how to choose what they want and how to find acceptable ways to ask for the assistance they need. Skills like setting personal goals, creating action plans, making appropriate choices, and advocating for themselves enable students to assume greater responsibility and control of their lives. People with disabilities have emphasized that having control over their lives, instead of having someone else make all of their decisions for and about them, is important to their self-esteem and self-worth. • Give opportunities for students to make choices, teaching them that they can exert control and that most choices have limited options from which to select. • Promote problem-solving by encouraging students to think aloud as they address simple problems. • Give feedback regarding the outcomes of their choices, teaching students to link choices and consequences. • Teach students to evaluate their work in comparison to a standard (“Does your paper look like this?”) to lay the foundation for later self-management skills. • Teach students to consider past decisions and determine if the consequences were what they anticipated or desired. • Teach students how to set and commit to personal and academic goals. Help them identify steps to achieve their goals and how to monitor their progress. • Encourage students to make decisions that affect their day-to-day activities, including academic goals, post-school outcomes, schedules, and others. • Help students understand the link between the goals they set and their daily decisions and choices they make. Help them break down long-term goals into short-term objectives. Promote active involvement in educational planning and decision-making. The Individuals with Disabilities Education Act (IDEA) requires that students from 14 years onward be involved in transition planning. The goals on the student’s IEP should be related to the student’s needs, interests, and preferences for post-secondary life. Communicate high expectations and emphasize students strengths and uniqueness. Students with disabilities are often all too aware of what they cannot do, and they often are not as aware of their unique strengths and abilities.